Volunteers build a home for a family in need. As Ambassadors of the Richter Center one of our priorities is to ensure we are being role models for other students on campus. We are all passionate about service and as we work to share our experience with other students, some of us have the opportunity to embark on service opportunities. Not only do we want others to volunteer, but we must remind ourselves why we became Ambassadors in the first place. One of those reasons is our passion for serving others. I am heavily involved with Greek Life at Fresno State. The Greek organization I have had the opportunity to be part of for three years, Alpha Sigma Phi Fraternity—in partnership with the Fuller Center Global Builders program—provides an international service and cultural immersion program for its members called the SIG Experience. I will attend this educational experience as I travel to León, Nicaragua with some of my fraternity brothers. 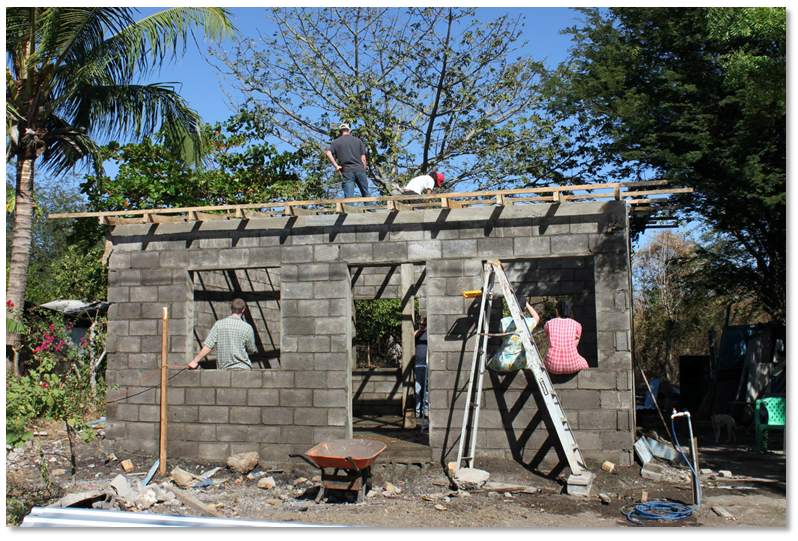 For a week we will provide hands-on assistance and build homes for families in need. The program is run in conjunction with the Fuller Center for Housing, a non-profit organization that builds and renovates homes internationally as a helping hand in partnership with those in need, not as a hand-out. Housing for those in poverty is a major issue in the world today – more than 1 billion people worldwide live in substandard housing and an additional 100 million are homeless. There is a need for decent homes all over the world, and even right in our own communities. That’s why I have decided to try to help out by partaking in this build. The SIG Experience will last from May 30 to June 5. We will spend the majority of the week working along-side the families and other local community members to build safe, decent, and affordable homes. In addition to building, we will also have the opportunity to take part in some cultural and community activities. My personal service experience abroad is not the only case in which an Ambassador will take initiative to serve and create an impact at an international level. Ambassadors in the past have taken trips to El Salvador, Fiji, and many other destinations. (In fact, recruitment is currently underway for the Fiji 2016 international service-learning trip for Fresno State students. Visit http://bit.ly/studytours for more info!) They have used their service experience abroad and helped it reaffirm their commitment to service in our local communities. While it is important to be a factor of change in local communities, it is a beneficial opportunity to step outside our nation take a look at the bigger issues going on other less privileged areas and use that knowledge to solidify the work we do at a local level. I have the opportunity to participate in an experience not many can make possible. The Ambassador program consists of student leaders who not only focus their efforts at a local level but also expand their service to the international community. Have you considered serving abroad? Why serve internationally? What benefits do you think you can bring back and apply at a local level?